In the last two years Peru has over taken Colombia as the number one distributor of counterfeit United States money. A police colonel in Lima, Peru was involved in a raid on a counterfeiting ring and was surprised to discover the counterfeiting skills of a 13-year-old arrested in the raid. The teenager was caught on the street with a sack of $700,000 in fake US currency. The 13-year-old received the money from a coconspirator in the counterfeit ring. The teen than led police to the facility where he and his fellow counterfeiters did their work. After the boy was arrested he demonstrated to police the meticulous skill it takes to make a counterfeit bill. Fox News says that the cheap labor and "less effective law enforcement" is what helped Peru become the number one maker of fake US bills. According to official reports from both Peru and the United States there has been $103 million in fake American dollars seized in Peru over the past decade. The Peruvian fake dollar is much harder to discover among real bills because the Peruvian counterfeiters go the extra mile and finish their bills by hand and not with the use of an inkjet printer. The US is only shipped $100 bills, these bills are easily circulated into store where clerks are not as vigilant about spotting a fake. Other bills like 10's and 20's are sent to countries neighboring Peru. Yahoo News is reporting "Demand is particularly great in Argentina and Venezuela because currency controls make the dollar so coveted and they mostly circulate on the black market." Counterfeit bill smugglers use similar tactics drug mules do in order to get their product into the United States. Counterfeiters have hidden rolls of bills in cases with false bottoms, in books, food, crafts and some have even gone so far as to swallow rolls of bills wrapped in latex. "It's a very good note," said a Secret Service Officer to Fox News. "They use offset huge machines that are used for regular printing of newspapers or flyers." After a note is printed the Secret Service officer, who was unidentified due to security reasons, said five people will often work on one bill adding fine touches to make it look authentic. 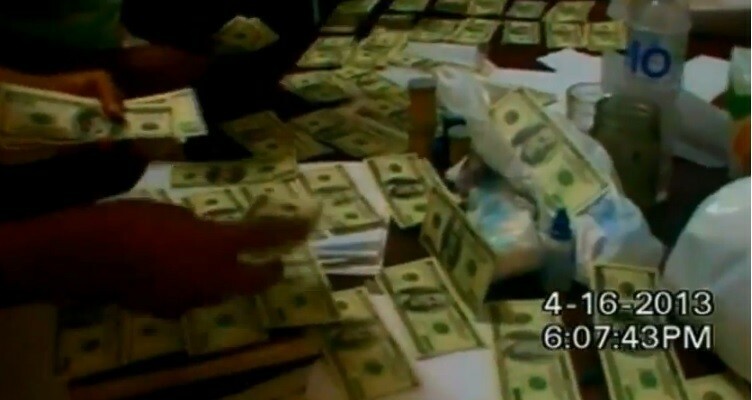 Beginning in the early part of 2010 there have been 296 arrests in connection with Peruvian counterfeit American bills. Global Post says only two-percent of the counterfeit bills remain in the United States. The fake bills are often laundered out and turned into gift cards making them legitimate forms of currency. The Peruvian counterfeiting operation has grown so large it has been described as better and more profitable than the cocaine business.